“The Kumbh’s organizers let everything else be handled by non-government entities like the akharas,” or religious orders, said John Macomber, a senior lecturer in finance at HBS, who came to Kumbh with his own mission: to turn its organized chaos into a Business School case study. This is the fourth in a series about Harvard’s interdisciplinary work at the Kumbh Mela, a religious gathering that every 12 years creates the world’s largest pop-up city. ALLAHABAD, India — Tiona Zuzul and Vaughn Tan were stumped. Walking along a crowded thoroughfare in the afternoon fog, they stopped to argue over the cacophony of motorcycles engines, distant drumming, and loudspeakers blaring Hindi chants. The sight that captured their interest wouldn’t have fazed the average observer. On one stretch of dusty road, vendors were lined up along corrugated metal dividers selling the same thing: aloo chaat, a snack of curried potatoes, which they scooped from the same large, flat pans for customers. To the two doctoral students at Harvard Business School (HBS) — Zuzul studies strategy and Tan is pursuing a joint Ph.D. in organizational behavior and sociology — the set-up was downright bizarre. “These look like the same potatoes, cut the same way, prepared with the same ingredients, served the same way,” Tan said. Tan, a Singaporean who has focused on culinary workers in his study of group innovation, can rattle off restaurant recommendations and street-food tips for cities all over the world. Zuzul comes from a family of business-minded academics (her parents founded the first private university in Croatia) and studies entrepreneurs in the smart-city industry. The Kumbh, at first glance, wouldn’t seem to offer them much: It’s the last place one would look for haute cuisine or high-tech startups. But for Tan and Zuzul, and for many of the Harvard researchers drawn here, the Kumbh offered the promise of a true blank slate. “It really does seem like certain things that are true of a city have happened here, given three months planning and one month of development,” said Tiona Zuzul, a Harvard Business School doctoral student. The pair wandered, snapping photos of vendors who lined main roads. 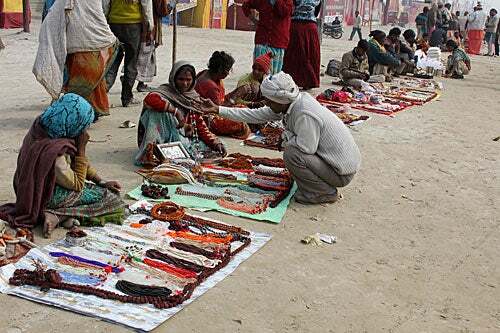 Some sold their wares — spices, beads, pipes, shawls and saris, Western-style men’s underwear — from blankets spread on the ground. Others sold dry goods and cigarettes from hand-drawn carts. Some had legal permits; many scattered at the sight of green-jacketed police officers wielding nightsticks that seemed largely for show. They stopped with their translator to question a family of booksellers, quizzing the father on how much he sold, how he protected his wares at night, and how business at the Kumbh differed from his normal routine in Allahabad. After all, Zuzul said, a city is more than just buildings and bridges, rules and regulations. “What makes a city a city is the way people behave,” she said — in other words, how they do business. The Kumbh Mela was perhaps a more obvious draw for Harvard researchers in public health and urban planning, who descended on the site in January to study the rapid deployment of medicines, housing, clean water, and other essential goods inside the tent city. But business professors came to explore the same questions. In addition to Zuzul and Tan’s fieldwork, a group of professors from Harvard, Stanford, and Columbia, led by HBS’s Tarun Khanna, came to study the development of networks and supply and demand issues, using massive amounts of cellphone usage data from one of India’s major telecommunications providers. For scholars interested in how communities emerge, adapt, and succeed, the Kumbh proved irresistible. But as Zuzul and Tan were finding, even researchers’ simplest assumptions about competition — that potato vendors or trinket sellers would naturally want to spread out and increase their odds of doing business, rather than cluster in one spot — couldn’t be taken for granted. Other elements of the Kumbh were oddly familiar. Some sectors had the feel of commercial districts, while some felt more residential, with government-approved restaurants and lots of foot traffic — “like Times Square versus Fort Greene, Brooklyn, or Boston versus Somerville,” Zuzul said. What was it that made those spaces so instantly recognizable as suburban or urban, they wondered, and was it somehow connected to the mix of retailers the Kumbh’s administrators had tried to foster? Government administrators’ ability to create distinctive neighborhoods in a temporary space could hold lessons for first-world real estate and commercial developers. “It really does seem like certain things that are true of a city have happened here, given three months planning and one month of development,” Zuzul said. John Macomber, a senior lecturer in finance at HBS, came to Kumbh with his own mission: to turn its organized chaos into a Business School case study. A rapid-fire explainer with a wandering attention span and a worn-out passport, he comes across a bit like a geeky Indiana Jones, pilfering not antiques but business insights. Every 12 years Hindu pilgrims gather at the confluence of the Ganges and Yamuna rivers in northern India to bathe in the sacred waters. The gathering, known as the Kumbh Mela, is the world’s largest religious festival, drawing millions of people over 55 days. To accommodate everyone, the Indian government creates a temporary city — building roads and providing power on what is normally an empty flood plain. 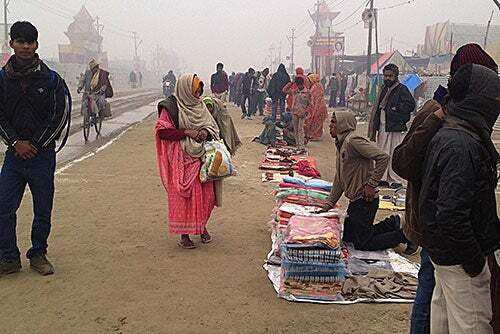 HBS senior lecturer John Macomber visited the Kumbh in January to find out how they do it. Macomber agrees with New York Mayor Michael Bloomberg: “Nations talk. Cities act.” As more of the world’s population relocates into cities, Macomber believes, they will become more powerful entities, like the city-states of ancient Greece. Cities also are becoming ever more important as centers of economic development, particularly in India. According to United Nations figures Macomber cited, 400 to 500 million Indians will move to cities in the coming decades. “Those people aren’t all going to Mumbai, Delhi, and Calcutta — these megacities can’t absorb all the rest of these people,” Macomber said. “They’ll have to go to tier-two and tier-three [cities] like Allahabad [population 1.2 million]. The question is, how do these cities attract industry and people, and how do they attract people with a choice”— corporate heads, artists, IT workers, and other wealthier, innovation-generating citizens? Countries with better central planning can control their rapid economic and urban development; China, for example, has been busy building transportation corridors to move tens of millions of laborers from the countryside to its major cities. “That kind of ability to move people and create industry is pretty frightening for the big, sloppy democracies, like the United States or India,” Macomber said. But while governments in democratic countries may be stuck politically, business can step up to look for ways to develop sustainably and efficiently. Macomber theorizes that cities must provide three essentials in place to help their citizens thrive, and they just so happen to be the things the Kumbh administrators focused on delivering: transit, water, and electricity. After all, creating livable cities on the fly, as the Kumbh shows, isn’t necessarily about harnessing the newest technology or cutting-edge engineering. “Mostly it’s about negotiation, business models, and which investors get the benefit,” Macomber said. Even at the Kumbh Mela, it’s business as usual. Learn more about “Mapping the Kumbh Mela” and follow the South Asia Institute’s blog on the project here. Read previous Gazette coverage here, and watch the Gazette for more stories on the Kumbh Mela throughout February. The 157 guns that would be banned by a renewed “assault weapons ban” proposed in the Senate were chosen because of the way they look and not the way they function, NRA President David Keene (left) told IOP Fellow John King during a talk at the Harvard Kennedy School.